Discontent, unrest and agitation engulf the coasts of our country. Fisherpeople, under severe duress, have no other way but to launch a national campaign to conserve the coastal and marine resources and to protect their lives and livelihood. The campaign begins on 1st May 2008. 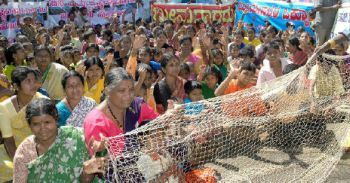 A central contingent of agitating fish workers starts Machhimar Adhikar Rastriya Abhiyan from Jakho, Kutch, Gujarat on 1st May and proceeds all along our coastline to reach Kolkata, West Bengal on 27th June 2008. This will be precursor to Fisherpeoples’ Parliament March in July 2008. India’s coastline of 8,118 km is extraordinarily rich in biodiversity, and its waters host one of the rich fisheries of the world. 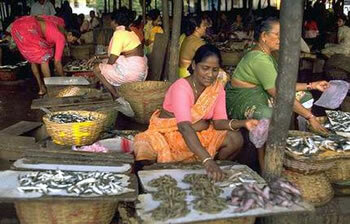 About 3.5 million fisher people live traditionally in 3200-odd villages along the coastline of mainland India. They supply more than 30 lakh tonnes of marine fish, the cheapest source of animal protein, to our people. The GDP from the entire fisheries sector is nearly Rs.30,000 crore. India earns Rs. 4,200 crore from export of fish every year. But today, our waters and coastal resources are being opened to the loot of big business. Innumerable beach resorts, hotels, mines, industries, nuclear and thermal power plants, hazardous chemical plants and hubs, industrial aquaculture, special economic zones (SEZs), special tourism zones (STZs), expanding coastal towns, cities, ports and harbours, ill-conceived mega projects (e.g. Sethusamudram Shipping Canal, Kalpsar Yojana etc. ), rampant reclamation, large scale mechanized and destructive fishing, are threatening our coastal environment, marine resources and traditional livelihood. The sea has become the dumping ground of all sorts of toxic wastes and pollutants. The crisis has reached such a point that a UNEP report, In Dead Water, has documented how the Indian Ocean has been turned into one of the major marine zones adversely affected by land-based sources of pollution. Unfortunately, and disastrously, the Indian authorities have not yet woken up to the task of reducing the pollution load devastating our aquatic environment. “PROTECT WATER - PROTECT LIFE”. In 1991, to prevent and minimize the impact of human activities on marine and coastal ecology, the Coastal Regulation Zone (CRZ) Notification was issued. In spite of its limitations, the 1991 CRZ Notification has been the first national statute to protect our coasts from ‘developmental’ activities. However, Central and State Governments hardly made any serious effort to enforce this notification. Our coasts continued to be increasingly targetted for 'development'. In line with this, the CRZ Notification was amended as many as 21 times, under pressure from commercial interests. Now the government wants to scrap the CRZ Notification and introduce a Coastal Zone Management (CZM) Notification with the intention of further selling out our coasts to commercial plunder and condoning all violations of CRZ that have taken place since 1991. The coastal fishing communities, the main stakeholders or more aptly rights holders, have never been consulted, let alone any effort to garner the strength of this community in managing the coastal resources. On the contrary, there has been systematic effort to shut off this community from any meaningful participation in coastal management. Banned by the Supreme Court of our country, industrial aquaculture had to loosen its widespread encroachments and poisoning of our coastal lands and waters. But the government has come to their rescue by enacting the Aquaculture Authority Act 2005 that paves the way to reinstate and revive coastal aquaculture in a big way. Conservation approaches adopted by the government are largely top-down and arbitrary. Declaration of marine protected areas entailing blanket ban on fishing, or declaration of ban on fishing species like sharks or sea cucumber, without investigating into and addressing the real causes and extents of degradation, only serve to bar the traditional fisherpeople from making a living from their fisheries. And the degradation continues unabated. While coastal lands and resources are being gifted to big business, the rights of the traditional fishing community to inhabit the land where they have traditionally lived and worked, remains unrecognized. This includes lands used for housing, to access the sea, to dry and repair nets, to sort, process and sell fish, and to berth boats. Most of the 3200 fishing villages do not have any land title or patta. Women in the fisheries sector, engaged in vending and traditional fish processing, do not have land rights. Women vendors, lack as well, even basic amenities like clean water, toilets and community crèches at their workplaces - the markets and fish landing centres. They are constantly being evicted from markets and denied vending rights. Corporate invasion into the fish retail market is further strangulating the livelihoods of traditional fish vending women and their access to fish. Fishing is among the most hazardous work; availability of work is seasonal and the income is uncertain. 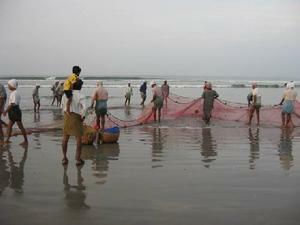 Fishing is largely a self-employment in India. Fishers fall lowest in the ladder – in terms of educational status, child mortality rates, nutritional status and poverty. In this context enactment of the Social Security Bill for Unorganised Workers and a national legislation to extend the benefit of ILO Convention on Work in Fishing to all fishworkers have become absolutely necessary. Our struggle against joint ventures in the 1990s had compelled the Government to rescind the Deep Sea Fishing Policy that allowed foreign fishing vessels in our Exclusive Economic Zone (EEZ). The High Power Murari Committee recommended to cancel licenses (existing at that time) and to stop permitting Joint Venture vessels. The Union Cabinet accepted Murari Committee recommendations. Going against its own decision GOI is again allowing operation of Deep Sea fishing vessels under joint venture arrangements as “resource specific”. Letters of permits (LOP) have already been issued to more than 100 vessels and GOI announced decision to allow import of 500 vessels under Joint Venture! The fishing community is under pincer attack. While SEZ, CMZ, STZ and industrial aquaculture are overshadowing the coastal zone; imported foreign fishing vessels are plundering the sea. The need of the hour is to rise with all the might and thwart this onslaught. ‘The life of the Planet and the welfare of the whole humanity must not be sacrificed to the greed of a few’. Recognize Inalienable Traditional and Customary Rights of Fisherpeople over Coastal Lands and Waters. Enact National Legislation for Conservation of Coastal and Marine Biodiversity that inter alia protects Traditional Fisherpeoples’ Preferential Access and Historic Use Rights to Coastal and Marine Resources. Develop Regional Mechanism to Facilitate Reciprocal Access to Adjacent Maritime Waters of Neighbouring Countries. Fishworkers Should Not Be Made Victims of Maritime Boundary Disputes. Recognize and Uphold the Importance of Women’s Roles in Fisheries – Recognize Their Rights to Social Security, Land for Fish Processing and Marketing, Basic Amenities, Child Care, Credit and Transport Facilities. Waive All Debts of Poor Fisherpeople along with the farmers. Provide Sufficient Cheaper Fuel for Sustainable Fishing. Enact National and State Legislation to Extend the Benefits of the ILO Convention on Work in Fishing to All Fishworkers.